A couple of years ago I was at the place where the year was quickly dwindling down and it had been rather hectic. As I realized that there were only a few months left of school, deep down there was a part of me that began to panic. I felt like I had failed at giving my children the best education possible. In fact, if report cards were to come out on me – the children’s teacher – I was to the point where I would have been satisfied with a C-. I was discouraged, and yet no one knew it. A homeschool monthly mom’s meeting was scheduled on the topic of “Homeschooling through the High School Years” and I knew this was just the encouragement I needed. So I put on a smile and headed out the door. But what was intended to lift my spirits, turned into guilt and great discouragement. As I listened to various moms share their experiences, I began to compare my life to them and a few hours later ended up driving home in tears. My discouragement lasted through the next day, until I finally picked up the precious Word of God. “In all thy ways acknowledge him, and he shall direct thy paths,” Proverbs 3:6. “Let thine eyes look right on, and let thine eyelids look straight before thee. Ponder the path of thy feet, and let all thy ways be established,” Proverbs 4:25-26. It was clear. My eyes were not fixed upon God. I was looking around to the left and right, comparing myself and my family to everyone else. 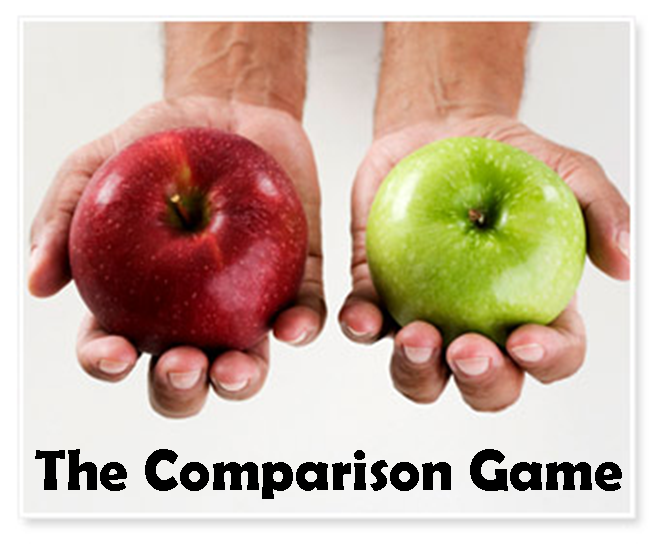 And it is just that – the comparison game – that will leave us discouraged every time. This is not the only thing that can contribute to this type of discouragement for moms. Books, magazines, and social media can all add weight to the problem. Ideas of having the “perfect” marriage or a busy mom’s guide to “getting it all done” can raise our levels of expectations to an unhealthy level. Pictures on Pinterest of beautifully-decorated, insanely-organized, and superbly-spotless homes can also add to the comparison game. Here’s the truth: Every family will look different. No marriage is perfect. We cannot and should not even try to do everything. And, having a lived-in home when love and laughter flows, is much better than the “picture-perfect” home where all are stressed over spills and messes. Don’t get me wrong. We are built for relationships and God will often use people to encourage and exhort us to be better wives and mothers. We should examine and learn from others, and we should follow after those who are living godly lives. The Apostle Paul said, “Be ye followers of me, even as I also am of Christ,” I Corinthians 11:1. But there is a difference between following others by letting their example be an encouragement to us, and comparing our lives to theirs. The Bible warns us to not compare ourselves with others in spiritual matters. “For we dare not make ourselves of the number, or compare ourselves with some that commend themselves: but they measuring themselves by themselves, and comparing themselves among themselves, are not wise,” 2 Corinthians 10:12. The principle applies here as well. It is easy to want to compare ourselves to others, but it is not others that should set our standards. God’s plan for our life is the standard all must seek. God created each of us in a unique way. He created our family unique. Unless we embrace our differences and seek out God’s will for our family, we will constantly struggle in this area. There is a fine balance between striving for excellence as wives and mothers, and killing ourselves by trying to live up to some unattainable form of perfection that we “think” we see in others. Let’s not forget that often we are only seeing highlights of people’s lives, moments of triumphs, and glimpses of won victories. Often the failures, struggles, and disappointments are not on display. This comparison game trap was a good reminder for me as well. When talking to a new believer, a first time homeschooler, or a newlywed I need to remember that each child of God is on a journey in life to walk in the ways of the Lord. We are all striving to live our life and raise our family in a way that is pleasing to Him. Some are simply further down the road than others. Some have been traveling longer. Some travel at a faster pace. And some take a different path altogether. My life will not look like yours. Your life will not look like mine. But let each of us look like Christ. If we are going to compare our lives with anyone, let it be His! “He that saith he abideth in him ought himself also so to walk, even as he walked,” 1 John 2:6. Be content to travel down the path that God has laid before you. Acknowledge Him, take your eyes off self, focus upon the One who establishes all your ways, and let the peace of God which passes all understanding keep your heart and mind focused upon Him.